It’s been nearly five months since R and I returned to Brooklyn from a three year stint in Boston. Though the southerner in me is thrilled to have escaped before Boston’s winter, I do miss New England summers and easy escapes to the idyllic surroundings of the Cape, Maine and Vermont. This Labor Day weekend, we trekked to Hyannis and boarded the ferry to Nantucket for four wonderful days. The biggest question on our mind – how to maximize the number of possible visits to Black Eyed Susan’s short of eating every meal there? There are a number of veg-friendly restaurants on the island, but BES will replace any protein on the dinner menu with tofu (which leads to some creative entrees) and will substitute tofu for eggs on the brunch menu. This weekend, we’re enjoying a lazy weekend at home. I played sous chef while R recreated some BES goodness for brunch with a tofu and cilantro chili pesto scramble. Squeeze the excess water out of the tofu and crumble it with your hands. Add tofu to an oiled, heated pan and saute for about 10-15 minutes until well browned. Season with salt and pepper. Remove tofu from the pan and then saute tofurkey until browned. Add garlic, red bellpepper, mushrooms and mustard greens. Saute for ~5-7 minutes then add cherry tomatoes. Add tofu to the veggie mixture. Stir in 3-4 tablespoons of pesto sauce and salt to taste. Garnish with cilantro. You can substitute any combination of veggies with this dish and leave out the tofurkey sausages if fake meat grossed you out. This is a great dish to make when you are trying to use up fresh veggies before they go bad. R had his scramble with eggs. 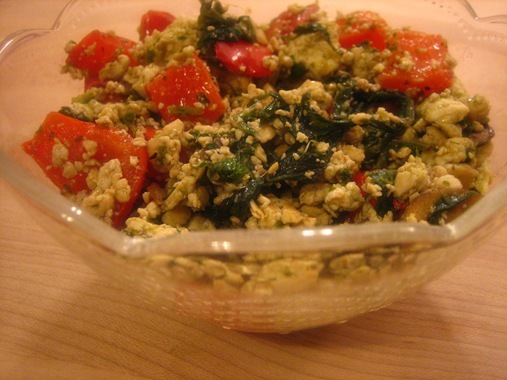 He scrambled the eggs in a separate pan and then mixed in the tofu/veggie mixture and pesto. We have some leftovers of the tofu/veggie mixture – I’m thinking about adding a little crumbled feta cheese and tossing it with pasta and marinara sauce or maybe even spread over a flatbread and broiled in the oven on low for a few minutes. Wow, this looks simply awesome. Nice subsitute to eggs.